Good-bye to a previous era. 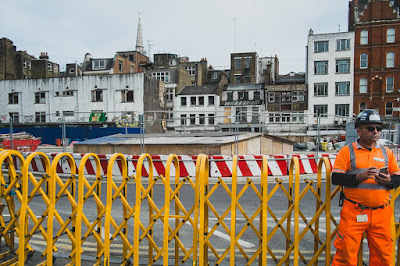 The bulldozers ready on the edge of the part of Soho known as Tin Pan Alley. Part of the Cross-Rail venture that will give London a much needed new underground linking east and west London will also remove large parts of areas in its wake. The proposed new area that will surround the new Tottenham Court Rd station involves the loss of large parts of Soho. To be replaced with ever more High St chains. The save Soho campaign has lost hope that they will be listened to. Read a little more about the history of area and those trying to save it here. Knock the old area down indeed! However what replaces it will be worse! No character just money making! Changes come and go I guess. Sad to see it happen. Good to document this. I guess it is for the better.